This wonderful villa is set in the hills of the private Santi Thani Estate. The villa has been cleverly designed to incorporate a wealth of advantages including light, airy rooms, cool dispersal of breezes throughout the house, stunning views over the Gulf of Siam, plenty of different areas for people to sit and relax and a general feeling of ease. There are lovely unspoilt beaches minutes away from the villa by car. On these beaches there are several restaurants serving both delicious Thai and International food. There are also food and clothes shops, open markets and supermarkets within 10 minutes of the villa. Whether you are looking for a quiet 'chill out' holiday, romance or sporting fun, you will find that the villa supports your mood and is always a welcome home to walk into. On the ground floor of the villa there is a very spacious hall with a minstrels gallery ensuring circulation of cool breezes. Off this hallway are the living areas of the house, the sitting room with sofas and chairs, the TV room with soft sofas, the kitchen which is well equipped and designed for easy food preparation with a serving bar. The dining room with table and chairs and a sideboard as well as a cupboard for the Hi fi equipment and books, guides etc. The Main Bedroom has a King size bed and two bedside tables with drawers and lamps. There are two large built in cupboards at the other end of the room leading to the bathroom en suite, and a dressing table. Sliding doors lead out on to a balcony with spectacular views and two chairs and a table. The bathroom has a large bath, walk in shower, basin and wc. In the second Double room there is a large double bed which can be split into two. In the second Double room there is a large double bed which can be split into two. There are two bedside tables with lamps and a fitted cupboard and dressing table. Sliding doors lead out on to the balcony with wonderful sea views and two chairs and a table. The third Bedroom has a double bed, built in cupboard and desk/dressing table. There is a large bathroom between these two bedrooms with a walk in shower, basin and WC. All bedrooms have an over head fan as well as air conditioning. Downstairs there is a further bathroom with a walk-in shower, basin and wc. The house is built around the west facing private swimming pool with two terraces either side of the west facing pool. 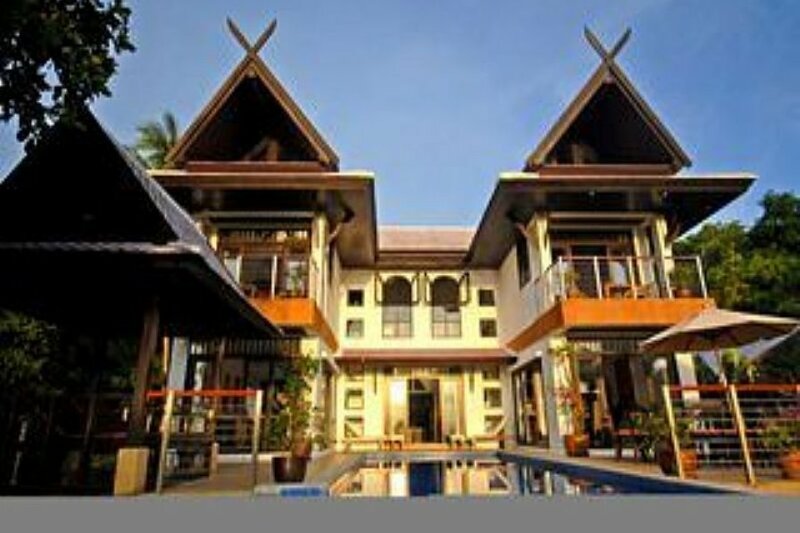 One of these has a lovely Thai sala with 2 sun loungers in it, and the other terrace has a table and 6 chairs for eating outside. As well as a large parasol to offer shade while you eat. There are further sun loungers and these areas as well as the pool and garden are lit at night. The garden is stocked with tropical plants and is a haven for birds. Bedlinen, towels and pool towels provided. The town of Nathon is ten minutes drive from the house where you can go to local markets and find clothes shops, arts and crafts stores as well as chemists and a Tesco store. Ten minutes in the opposite direction there is the small town of Maenam where there are many restaurants and small shops as well as the Maenam beach on which there are plenty of bars and restaurants. There are also fresh food markets here as well as small supermarkets where you can buy most essentials. Local activities: diving, swimming, tennis, walking, sailing, cycling, fishing, horse riding, golf, wind-surfing, kite boarding, water skiing, massages and spas. The pool and garden will be maintained and kept clean during your stay. Please note that your airport transfers are included in these rates as well as a welcome pack and maid service three times per week.